An epic sporting battle took place as part of WIT Students’ Union’s ‘Raise And Give Week 2013’ with students from the BA (Hons) in Exercise & Health Studies in the Department of Health, Sport & Exercise Science taking on staff in the pool, on the bike and on the road. The inaugural ‘Student versus Staff Triathlon’ took place on Monday, 25 February and was organised by Aoife McMahon and Bruce Wardrop from the Department of Health, Sport & Exercise Science. The first leg of the event started at 2.00pm in the Waterford Crystal Swimming Pool. 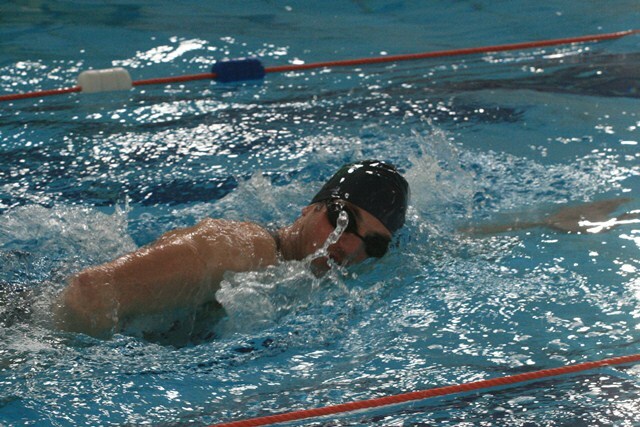 Student Tommy Bergin took on lecturer Aubrey Storey in the 750m swim leg, with Tommy winning out with a time of 9 minutes 11 seconds to Aubrey’s 12 minutes 9 seconds. With the young bucks off to a dream start, the next set of competitors started the four mile run leg which involved five loops of the college. Lecturer Barry Lambe narrowly won this leg, recording a time of 24 minutes 20 seconds with student Stephen Walter only seconds behind with 24 minutes 40 seconds. The students had a 2 minute 38 second edge going into the final 20km cycle leg, leaving lecturer Stephen Barrett with it all to do over student Shane Kelly. However, student Shane kept his cool beating Stephen by 1 minute 10 seconds with a time of 29 minutes 30 seconds, winning the leg and securing victory in the triathlon. So, youth won out this time but watch this space. The staff will be back! The Student versus Staff Triathlon is just one of a series of charity events and fundraisers as part of WIT Students’ Union’s Raise And Give Week 2013, including bake sales, sporting competitions and numerous social events. Working in partnership with a number of local businesses, the week is designed to create awareness and raise much needed funds. The four charities that all profits from the week will go to are Save Ryan and Ethan Appeal, Friends of Assisi House Waterford, Make a Wish Foundation and Crumlin Children's Medical Research Foundation. Over the past seven years, WIT Students' Union has raised over €200,000 for local and national charities.